Being interested in the origin chocolate world, means you look around for opportunities to taste new chocolates and to meet people who share your interest. Some time ago, I was introduced to Zoi Papalexandratou and Tom De Winne at a tasting I hosted. Zoi and Tom, both engineers in bio-applied science, run Zoto. A Belgium based consultancy company focusing on cocoa related projects. They offer their services to cocoa growers to help them with plantation management, processing facilities and post harvest techniques. 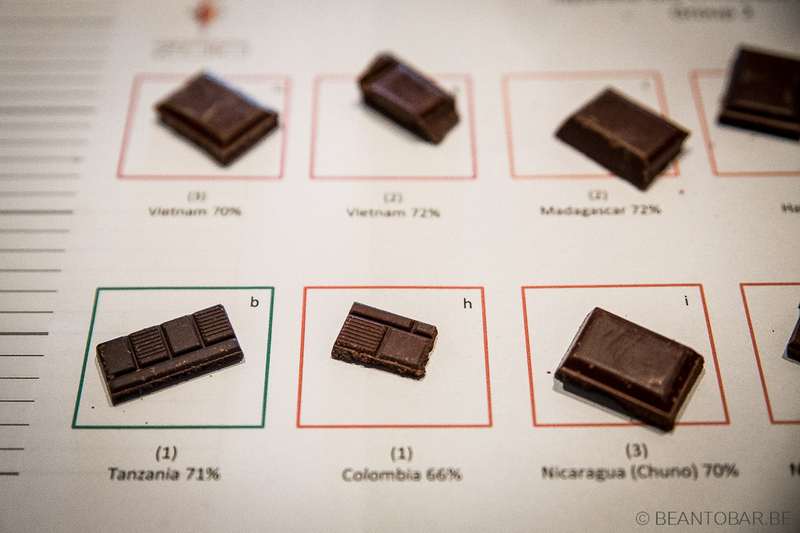 With an extensive knowledge on cocoa, they also help chocolate makers choose the right beans to create a chocolate with the specific flavor profile they desire. Both travel all over the world to visit their clients. This gives them the opportunity to bring back home special chocolates that aren’t available on the local Belgian market. Zoto organizes specialized bean to bar chocolate tastings with these products to share their discoveries with fellow chocolate enthousiasts. I was more than happy to attend their event on Japanese bean to bar chocolate. Japan has been known to me as a chocolate addicted country. Massive amounts of chocolate are imported every year to the land of the rising sun. Even several Belgian chocolate makers have their permanent shop set up over there. Chocolatiers are hardly able to keep up with demand. But lately we also see Japanese bean to bar makers popping up. Often they produce for the local market and are little know outside the region they are from, making it hard to get your hands on them. 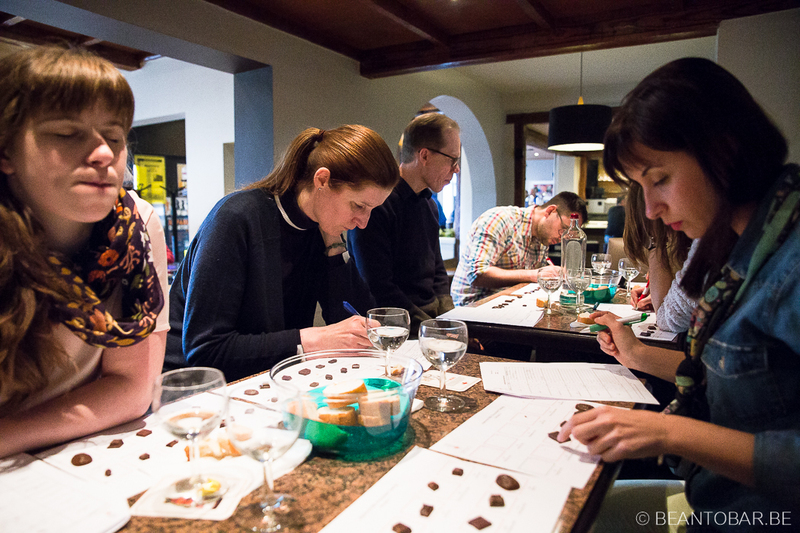 This tasting was an ideal opportunity to get a taste of what Japan has to offer in the field of bean to bar chocolate. Zoi and Tom offered a very generous 12 samples from 7 different chocolate makers. Quiet impressive. They have a distinct way of performing a tasting. On arrival, every attender gets a selection of samples identified by a number. Every piece of chocolate is tasted and notes are written down. After a series of chocolates, the results are discussed amongst the contenders. Without knowing the maker, just the origin and percentage, you really pay attention to the chocolate without prejudice. The results are surprising. At the end, Zoi presented us with all the needed info on the chocolate makers and revealed the packages. 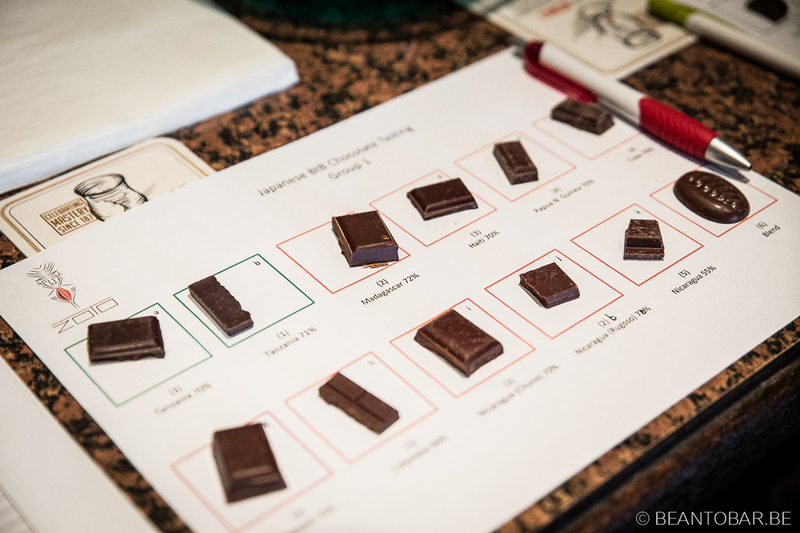 The vast cocoa knowledge of Zoi and Tom means you always learn new facts and get a deeper understanding on how premium chocolate is developped. Other than just giving info on the chocolate maker, they add tons of info on the cocoa genetics, post harvest processes and a chocolate flavors. It becomes clear they really understand cocoa and taste on a different level than I’m used to. This section gives you a quick idea of the chocolates presented. These tasting notes only reflect my personal experiences with the chocolate. 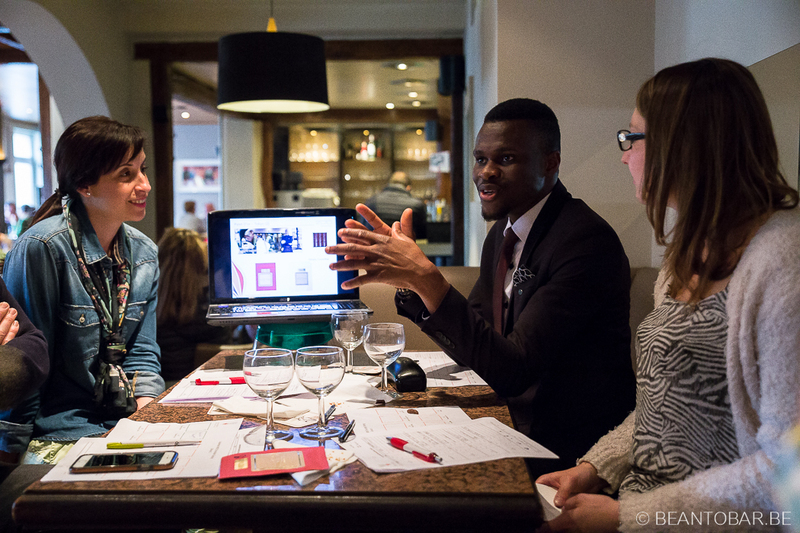 Due to the different background of the people attending, tasting notes differed quiet a bit. Always ground for a nice discussion about the products. Tanzania 71%: A distinct green banana aroma. Starting sweet, dried fruits and a touch of alcohol pop up. Nibs add create a building intensity. The chocolate ends woody and offers a roasted aftertaste. The texture was quiet rough. An interesting chocolate with some work on the texture to be done. Colombia 66%: Dried fruits in the aroma. Flavor wise, the chocolate is sweet, offers brown sugar, wood and clear roasted coffee – moka style. Still above average, I liked this bar less than the Tanzania origin. Vietnam 72%: Roasted nuts and chocolate in the aroma. The flavor starts off heavily roasted, almost in Pralus style. It continues very chocolaty, while nice yellow fruits glide in – raisins. Finally a roasted aftertaste emerges. While the texture is a bit clingy on the tongue, the snap is hard. I missed the spices Vietnam cocoa can delivery in such an abundance. A higher ranking chocolate. Madagascar 72%: The aroma is particular chocolaty in nature. The flavor starts off far less roasted compared to the Vietnam bar. It offers lots of dark chocolate with subdued red fruits – red and black currant come to mind. The texture was once more clingy and slightly fatty. Though the red fruits were there, I like them more powerful in a good Madagascar bar. Above average and enjoyable, but could be better due to the texture. Nicaragua 70%: A Rugoso cocoa bar. A sweet and chocolaty aroma. The flavor starts sweet as well, offering roasted bread, brown sugar. A slight floral note combined with preserved fruits precede a smoky after flavor. Even is a hint of pepper is detected. The snap is softer than the one of other bars. One of the best bars in the line-up due to the complex and enjoyable flavor. Vietnam 70%: Another Vietnam chocolate. It shows an earthy start with gentle acidiy and a cheesecake tartness near the end of the melt. A long woody aftertaste follows. The chocolate had a very hard snap, revealed some small inclusions and really resisted melting. Below average due to a very straightforward aroma, tannins and limited complexity. Haiti 70%: After a chocolaty and dried fruit loaded aroma, it was a surprise to experience a floral start. Later on it became sweeter, with hints of roasted bread, vanilla and soft wood. The aftertaste was less intense than the Vietnam bar. Best bar of the event. Nice evolving and interesting flavors and good complexity. Nicaragua 70%: A chuno cocoa bar, showing sweet aroma (molasses). The flavor was starting of dry, turning to malt, dried wood and a lactic cheesecake note. The aftertaste remained earthy with dry tannins. The texture was buttery. The bar lacks some typical Chuno notes, such as walnut en chestnut. Average on the tasting scale. Papua N. Guinea 70%: Tobacco and chocolate in the aroma. The flavor shows sweet roasted coffee, some faint preserved fruits and a hint of mushrooms. The snap was soft and the chocolate had a grainy texture. Though some aroma’s were intriguing, most people around the table didn’t like the flavors at all and found the bar unpleasant. Cuba 70%: A difficult bar to describe. Some roasted nuts, a floral hint and sweet smoke. Inclusions were found in the chocolate. Not a remarkable piece of chocolate. Nicaragua 55%: A low percentage bar with a chocolaty aroma. The flavor started of with strange mushroom flavors, turning into roasted nuts and praliné. There were some stale notes in the flavor, making it unpleasant. The texture was buttery. Blend: Finally an industrial product, presented as callets. The sweet vanilla aroma didn’t predict much good. This was confirmed in the sweet, vanilla, milk chocolate and malt flavor. The texture was buttery and clingy. Not good. 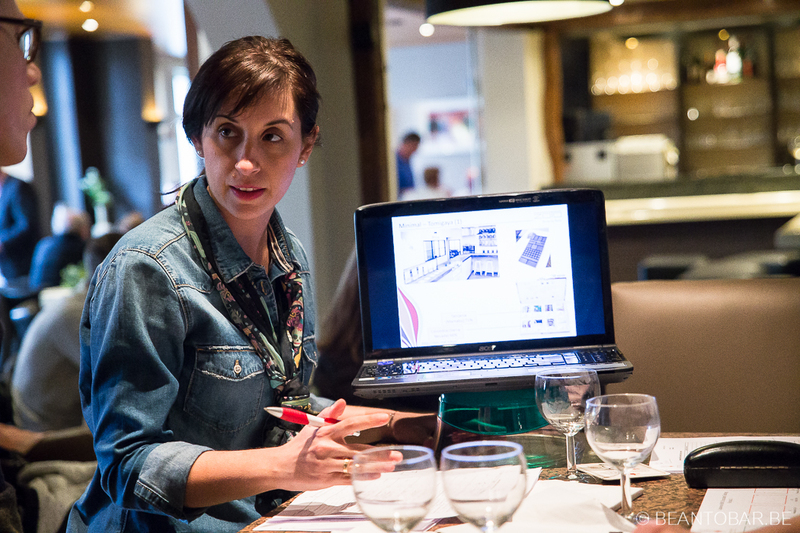 The session gave us a nice overview on what is currently available on the Japanese bean to bar market. 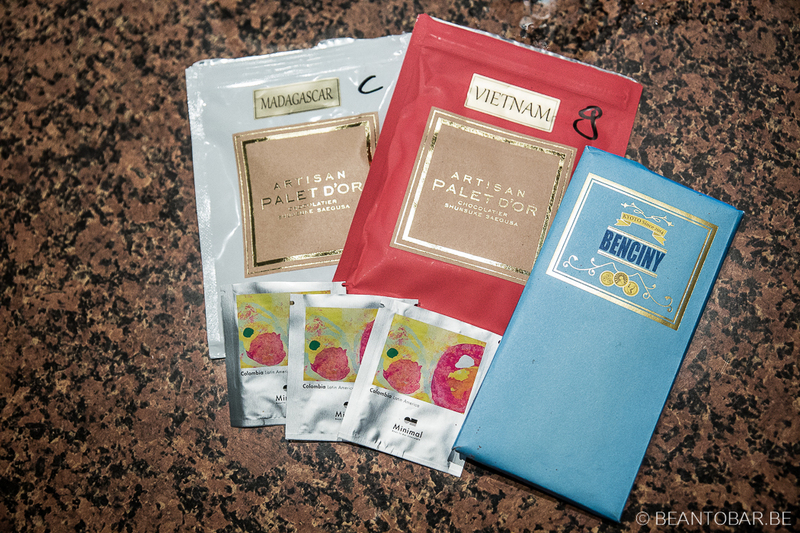 Not every bar is convincing, yet Palet D’or and Benciny offer some very tasty chocolates. However, Benciny can’t keep up the same good quality in every bar. Kongen Sweets delivered a nice surprise with a great tasting bar, yet also lacks a bit in the texture department. Minimal offers nice flavors, but texture could be better. Saturdays Chocolate and Vanilla Beans Chocolate fail to impress. The industrial couverture blend has a very industrial flavor profile and clearly isn’t meant for the fine chocolate public. At the end of the night, we concluded there is potential in Japan. But at the moment, it is hard for them to compete with the current level of quality produced by the best chocolate makers in the US and Europe. The origins present are very comparable to what is on offer from many other chocolate makers. Finally a word on the packaging. Japanese chocolate is exotic, especially when you see it in its wrappers. Though I find they seem to hold back from the flashy colors often seen in Japanese commercials and products, you feel they have a different view on design compared to the West. Obviously French inspired, the wrappers often look like perfume packaging and want to show you this is a luxury product. Prices are quiet steep as well, especially when you look at the quality delivered. This will make it hard for Japanese chocolate to enter other markets around the globe, if they wish to do so. A big thanks to Zoi and Tom, this was a very interesting chocolate experience!